One for joining the Host Club, and one for becoming a client. What are we? A club that dedicates itself to entertaining our clients. What do we do? We usually dress up-muggle term is 'cosplay'- and as I stated before, entertain our clients. Usually, this includes the skills of acting. What does the club entail? We low-key flirt-remember the 'low-key' part- and give out treats to our clients. What is the benifit? It gives you and our clients a chance to have fun. Can females join? Since this club is based off of the anime, 'Ouran Highschool Host Club', yes they can, but only the first female to apply. If you want more details, please scroll to the 'Rules' section. How will this work? Since the answer to this question is long, you can find this information in the section with the same name as this question. Do I get to chose my type? Unfortunately, no. I am very picky about my members, so I will be personally checking your account to see if you are qualified or not for the position. If a person who had applied has similar traits to a host member, they will be rejected. How many members will be accepted? Only the first four males will be accepted. The first female will also be accepted, so nothing more, and nothing less. What if a member quits? Then there will be a chance to join, once again. Are Non-Binary female characters allowed? Yes, they are, but they will be counted as the single 'female member'. Do you post the application in the thread? You do not have to, but it is highly recommended. There will be two other threads, both for every member. One of which will be only for club members, the other is for all. The one that will be just for members, will be called 'Hogwarts Host Club Meeting Room'. 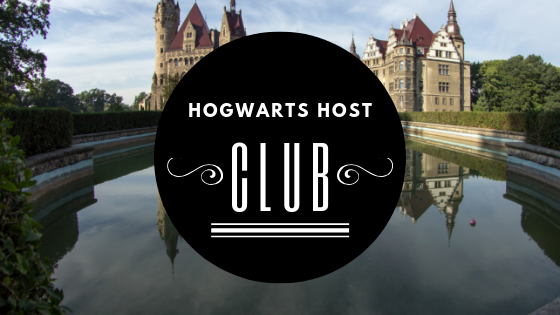 The one where both clients and members can converse will be called 'Hogwarts Host Club Main Room'. The intro layout for the Main Room will be similar to the Member Thread, but will have the information of all the members. The last thread, is mainly for the clients. It will soon be called 'Hogwarts Host Club Client Room'. The Host Club is not allowed to interfere much, without my permission. They will be able to discuss about the Club there. If you apply to be a client, and get accepted, you will automatically be accepted to the thread. You may find your name there. If you do not, please contact me through owl. You do not have to apply to be a client, but it is highly recommended. It gives the Hosts a heads up on who will be attending to their thread. Also, be aware that none of the threads are released yet. Please answer in an OoC manner. Also, the club will be open every Saturday and Sunday. Last edited by Harley Witstone on 12th October 2018, 12:03 am, edited 3 times in total. I had one question even though I’ve seen the anime and know how this works. Do we apply in the thread or do we owe you? First of all, Jay is very intelligent in a muggle way. And I’m not sure if they are also intelligent the wizard in way too. (I haven’t a lot of the homework since I haven’t gotten much time) They are very good at drawing and visual-arts, they are also secretly talented singer/song writer. Is knowing two different languages a skill? If it is, they are fluent in Japanese and French (as I do irl). Last edited by Elia Wilfor on 1st November 2018, 6:37 pm, edited 2 times in total. Lucien is very talented in music and literature, he could probably spout lines of Shakespeare in his sleep. He has a silver tongue, which usually gets him through most hard situations. He almost always seems to have a calming aura around him. He is rather good at calming people down. Lucien is extremely smart and on the brink of creating a cure for myopia, despite only being in his second year. Plus, having two different eye colors is rather hypnotizing it seems. Though he is a very well mannered person, he is often sarcastic towards people is rather close to, however his sarcasm is never hurtful oddly enough. Ouran High School Host club is one of my favorite shows. I feel it would be a great opportunity for Lucien to communicate with others instead of reading all day every day. He needs to boost his social skills up a bit more than they are currently. Skills: Constantine is best described as a jack of all trades, but a master of few. He is excellent at training animals, be it muggle-bred or magic-born. Fairly unpredictable in nature, Constantine's next move can rarely be pinned down, unless you've spent a lot of time with him. Most of his energy is spent doing something athletic, or chasing down anything that is labelled 'dangerous' or 'adventure-worthy'. Whilst he is generally friendly, he has an awful temper if provoked, one that will not allow him to back down easily. Why are you interested in this club? : I'm trying to get back into roleplaying, so this might be a good start! Constantine is also a fairly social person, so I'm sure he'd fit in well! From this point, if you are a female, feel free to go and apply for 'client' position!